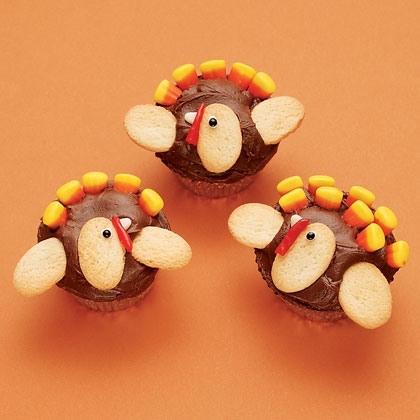 Candy corn plumes and shortbread wings turn cupcakes into irresistible turkey sweets for Thanksgiving. 1. Frost the cupcake, then press in a cookie head and 2 cookie wings. 2. Press in a row or two of candy corn tail feathers. 3. To make an eye, add a small dot of white icing to the head, then add a dot of black decorators' gel for a pupil. 4. For a beak, cut the white tip from a piece of candy corn and press it in place. 5. To make the wattle, cut a 1-inch square of fruit leather. Roll it into a tube and stick it in place over the beak. 1. In a medium size bowl, mash cream cheese. Mix dressing mix and Cheddar cheese into the cream cheese. Shape the mixture into a ball. 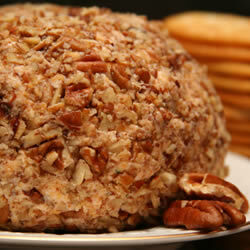 Roll the ball in the chopped nuts. Refrigerate covered until ready to serve. Yum! 3. 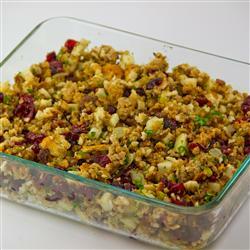 Arrange the chopped onion, chopped celery, and chopped carrot around the turkey in the roasting pan. If desired, the neck and giblets may be added to the vegetables. Sprinkle the remaining thyme and marjoram over the vegetables, and pour the chicken stock into the pan. 4. Roast turkey 30 minutes in the preheated oven. Reduce oven temperature to 350 degrees F (175 degrees C), and cover turkey loosely with foil. Continue to roast, about 3 to 4 hours unstuffed or 4 to 5 hours stuffed, until the internal temperature of the thigh reaches 180 degrees F (80 degrees C) and stuffing reaches 165 degrees F (75 degrees C). Transfer turkey to a platter, and cover with foil. Reserve pan mixture for gravy. 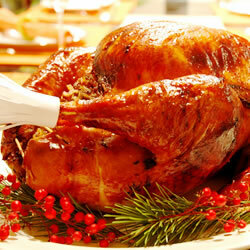 Allow turkey to sit about 25 minutes before removing stuffing and carving. 5. To Make Gravy: Strain pan juices into a measuring cup. Spoon fat from juices. Add enough chicken stock to make 3 cups. Transfer liquid to a heavy saucepan and bring to a boil. In a small bowl, mix reserved maple butter mixture with flour to form a paste, and whisk into the broth. Stir in thyme, bay leaf, and apple brandy. Boil until reduced and slightly thickened. Season with salt and pepper to taste. 2. In a large bowl, slightly beat eggs. 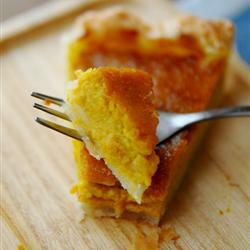 Add brown sugar, flour, salt, 2 cups of the pumpkin puree, pumpkin pie spice, and evaporated milk. Stir well after each addition. 3. Pour mixture into the unbaked pastry shell. Place a strip of aluminum foil around the edge of the crust to prevent over browning. 4. Bake 10 minutes at 450 degrees F (230 degrees C), then reduce the oven temperature to 350 degrees F (175 degrees C). Bake an additional 40 to 50 minutes, or until a toothpick inserted near the center comes out clean. Remove the strip of foil about 20 minutes before the pie is done so that the edge of the crust will be a light golden brown. Cool pie, and refrigerate overnight for best flavor. Have a recipe you think we should add to the list? Guests are family at Pine Mountain RV Resort and Thanksgiving is a time when we want to show our thanks by hosting a dinner…Pot Luck Style! 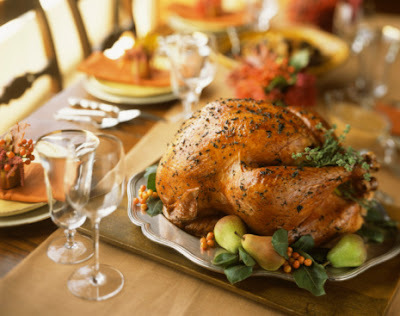 At 2:00pm November 22nd, we will all meet at the large activities building to enjoy a festive dinner together. This holiday we want to see your cooking skills. All we ask is that you cook and bring your favorite side dish, dessert, or special entrée to share with everyone while the Nichols Family will be showing us their amazing Turkey cooking skills! At 3:00pm Santa will make his first appearance in the front Lodge to give out candy canes to all the good little girls and boys. Be sure to bring your cameras because Santa will be taking pictures with the children as well! Please be sure to register for the dinner in the lodge. 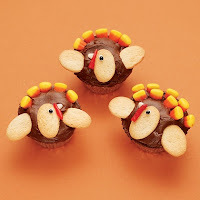 We are asking that everyone registers the day before Thanksgiving (November 21st) to be sure there is plenty of turkey and dressing to go around. Thank you and we look forward to seeing you soon!